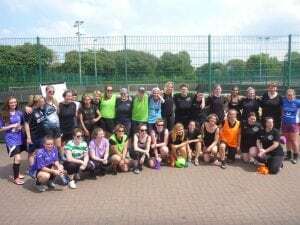 Created in response to a perceived lack of social football for women, Ladies Recreational Football and Sports (LaRFs) has been enabling women to participate in social football since July 2017. It has done so by trying to shift the focus of physical activity to being about fun and a way for women to connect, rather than competative sporting ability. Currently LaRFs runs regular inclusive football and walking football sessions in Glasgow and Edinburgh for women regardless of age, ability and fitness level. This woman-run organisation also offers coaching and volunteering opportunities to participants, so they can develop technical and personal skills. LaRFs are planning to add recreational netball and walking netball sessions to their sports offering, in November 2018. LaRFs main offering is zero commitment, low cost pay-per-play weekly football sessions indoors and outdoos in Glasgow and Edinburgh. Women aged 18+ are welcome to attend these evening sessions. Each session is comprised of a warm-up – normally football skills drills or a brief walking football or walking netball game – followed by a game. Teams are formed based on the session’s number of participants. Rules are kept to a minimum to promote a relaxed fun environment. These sessions aim to encourage women to improve their physical and mental wellbeing by developing their fitness and spending time playing and socialising with old and new friends. LaRFs second offering is a longer session run on a Sunday afternoon. Women can drop off for coaching and/or a game. The aims of the Sunday sessions are for women to improve their technical skills and to develop female coaching role models. Participants who have attended LaRFs sessions regularly have been given the opportunity to attend Scottish FA coaching courses to support LaRFs’ organiser in session delivery and increase the representation of female football coaches in Scotland. At both sessions, a shared aim is to actively encourage players to volunteer for a range of roles to support the club and develop their own personal skills and confidence. These volunteer roles include promotion of the club through social and graphic design media, management of team equipment, first aid, meeting new players and collection of subs. The organisation’s third offering is organisation and participation in tournaments and friendly games with other recreational clubs in the UK. The aim here again is to enable players to take on volunteer roles in tournament delivery. This offering also helps players increase their social networks of like-minded women. LaRFs forth offering aims to provide a means to (financially) support operation of its regular weekly sessions. The organisation offers walking football and walking netball to other organisations as a team-building/wellbeing taster session. These sessions help collagues to connect, have a new learning experience and be physically active. The walking version of recreational football/netball means that everyone can participate regardless of age, fitness or gender. It’s also a great leveller – people who have played before need to think differently and people with no playing experience can quickly begin to learn. Above all, it’s a lot of fun! In its first year of operation, LaRFs avaeraged 14 women attending its weekly evening sessions. The first LaRFs tournament organised as part of LEAP Sports Festival Fortnight attracted approximately 35 participants across 4 teams, along with their families and friends. 3 women have taken SFA coaching courses to date; 2 more women plan to take a course before the end of 2018. 4 women are scheduled to do a first aid course in October 2018. 22 women attended the LaRFs Christmas game and meal. 14 women attended the LaRFs 1st birthday celebration. Several women who have come along to the sessions mentioned the fact the football enables them to ‘switch off after a busy or stressful day’, ‘have a laugh’, and ‘catch-up with friends’. Other comments noted include the friendly, welcoming and inclusive nature of LaRFs and relaxed, low-entry level access it provides to football. From day one LaRFs has worked closely with LEAP Sports Scotland to help ensure LGBTI women feel included and safe within their sporting space. LaRFs is open and welcoming to anyone who self-identifies as a woman, helping to ensure trans women, as well as non-binary and gender fluid people who identify in a significant way as women or female, know they are just as valued as their cis women counterparts. Many Scottish society consider women’s sport to be inclusive of lesbian, gay and bi-sexual women. LaRFs don’t make the assumption that everyone feels this way, participating in campaigns and events run by LEAP Sports to help show their true rainbow colours. LaRFs also welcomes opportunities to engage, understand, take pride in and celebrate the history of women in football and sport. Recent examples of doing so include sports-focused organised sessions at Glasgow Women’s Library and Hampden Football Museum (ran by United Glasgow FC as part of International Women’s Day). If you or your friends would like to try (or return to) fun, non-competative, zero commitment, friendly football or netball, you would be very welcome at Ladies Recreational Football and Sports! If your organisation would like to promote team-building as well as mental and physical wellbeing, LaRFs walking football and walking netball sessions are fantastic enablers.